Once again I am continuing my travelogue about my trip to France from last September. The last full day we were in Paris, I wanted to visit a palace. Most Americans I know would have suggested visiting Versailles for that purpose, but I chose Chantilly instead. Chantilly is an hour north of Paris and to get there without a car, you must use the train system. That meant we had to plan our day carefully by studying the various schedules. We took the RER and traveled to Gare du Nord, there we had to find the Grande Ligne level (upstairs) and purchase tickets to the RER Line D to Chantilly/Gouvieux station. After wandering aimlessly around the station for a little bit, we found where we needed to be in time to make our connection without having to wait too long. Once we arrived in the train station in Gouvieux we walked to the grounds at Chantilly. It took us about half an hour to get to the park, but we timed ourselves to know how much time we should allot for our return walk to the train station later that day. One of the reasons I chose Chantilly over Versailles, was not only the idea of not having to fight enormous crowds of tourists, but this palace is also a premier tourist attraction for equestrians. There are horses throughout my story, so I liked the idea of visiting the Musée Vivant du Cheval. The architect Jean Aubert was commissioned by Louis-Henri de Bourbon, 7th Prince of Condé, to build the grand stables. Legend has it that the prince thought he would be reincarnated as a horse, so he wanted stables that would reflect the majesty of his rank. Thanks to him, France boasts an architectural masterpiece of the 18th century. Here is the horse "barn" itself. The picture was taken from a distance in order for its magnitude to be comprehended. To the left you can see the white plumes of tents where a riding competition was taking place that day. To see the layout of the horse museum, you can find that here. The courtyard rivaled the one we saw at the Louvre. Inside is a staging area where the horses are brought out and shown to the public. Our timing was bad that day and we did not catch one of the demonstrations, but it still was incredible to see where they performed. Overlooking the round, you can see the grand dedication to the man who had this edifice created, Louis Henri de Bourbon, the seventh prince of Condé. Given the amount of material wealth concentrated not only in the palatial estate, but the horse compound, it is understandable why this was attacked by the peasants during the French Revolution. If I had been struggling to survive, I would feel offended by the opulence displayed at the Chateau de Chantilly. In the horse museum you not only see stalls filled with beautiful animals, but art exhibits dedicated to all things related to horses. There are rooms filled with horses from carousels, saddles and spurs, as well as paintings and drawings of horses. I even found examples of Bayardo, the legendary horse in the Matters of France owned by Rinaldo. Bayardo would magically expand in order to accommodate all four brothers: Rinaldo, Alardo, Guicciardo and Ricciardo (AKA Ricciardetto). 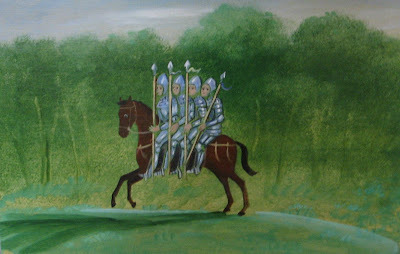 I was thrilled to find this painting and it happened to be the one of the few representations I found during my trip to France depicting showing the legends of Charlemagne. I saw books on the legends of Arthur, but precious little about the legends of Charlemagne. I found that curious and disappointing. The museum also had some models of warriors on horseback. Here is their Charlemagne. After we finished our tour of the , we were famished. There are a few restaurants to choose from at Chantilly and after looking at the various menus, we settled on La Table des Lions which is a bit of a walk outside the park proper. The food was wonderful. The best meal we had in Paris, even though technically we were not in Paris. Scott remembers having French onion soup and trout. I had beef with a wine reduction sauce. Then I remember splurging on dessert. Knowing my preferences, it was probably something chocolate. It was also the first time that I succumbed to temptation and had wine with lunch, even though my husband had done that since the first day we arrived in France. This food deserved having the accompaniment of wine for its flavors to be fully appreciated. After a grand lunch, we set out to see the chateau itself. The day was cool and overcast, which is something we had become accustomed to in Paris. I was glad I had worn a sweater and brought my jacket for we were walking outdoors for most of the day. Here you can an equestrian statue prominently displayed between the chateau and its extensive gardens. Here is another view of the chateau. Here are the manicured gardens behind the chateau. Inside the chateau is an art gallery which has an extensive collection including three paintings by Raphael. After touring the parts of the chateau that were open to the public, we were soon checking our watches to determine when should head back to town and catch our train. It had been a long wonderful day. Here I am next to a sphinx, feeling a bit tired, and squinting into the hazy sunlight. That leg of our journey was almost over and the next day we would be headed towards the sunny south of France. That's definitely more fun than the tourist overloaded Versailles. I'll put it on my list. I went to Chantilly only last week and it was beautiful! Good luck with your book! I am glad you enjoyed them and hope you had a wonderful visit at Chantilly.